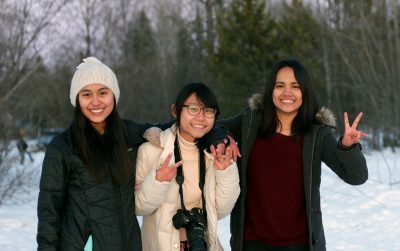 When Kanyarat “Kate” Jitmana ’18, Supasiri “Mos” Rittiron ’18 and Chanchanok “Saw” Sudta ’18 join the procession to Commencement Plaza on Saturday, the three young women will be celebrating a journey that began more than 8,000 miles away in Thailand. All three Pitzer seniors came to the College on Royal Thai Scholarships, highly competitive governmental awards that support exceptional students’ undergraduate and graduate studies abroad. Every year, thousands of high school students compete to become one of 200 fully funded Royal Thai scholars, who travel abroad to earn international degrees before returning to Thailand to work. Between 45 and 60 Royal Thai scholars choose to study in the US each year. Jitmana, Rittiron and Sudta are three of 14 Royal Thai scholars who have studied at Pitzer since 2007—a figure that currently includes a first-year student and two sophomores. The scholars are standouts both in their own country and in the US, according to Todd Sasaki, director of international programs. “In addition to being some of the brightest students I’ve seen, they are also some of the hardest working,” Sasaki says. Jitmana is a mathematics major who specializes in mathematical biology. Rittiron, a geology major with a minor in environmental analysis, has conducted research on the San Andreas Fault. Sudta, a biology major, studied tropical ecology at Pitzer’s Firestone Center in Costa Rica. After graduation, all three plan to go on to US graduate schools before establishing their careers in Thailand. Sasaki says Royal Thai scholars take full advantage of opportunities available on campus. Although Jitmana, Rittiron and Sudta are already studying abroad by attending Pitzer, all three spent summers or semesters outside the US as well: Rittiron in Finland, Sudta in Costa Rica, and Jitmana in Costa Rica and South Korea. They also have conducted summer research, joined student clubs and traveled around the US. Sudta says Pitzer’s small size has led to vast possibilities. “In a larger university, I don’t know if I would have been a research assistant, but here, we all know each other, and there are a lot of resources for students to explore,” she says. The three students embarked on this educational expedition in their early teens. Jitmana, Rittiron and Sudta first earned scholarships to study mathematics and sciences at some of Thailand’s best high schools before landing the even more competitive scholarship to pursue undergraduate and graduate studies in the States. After completing a six-week summer program in New Hampshire, they each enrolled in a US boarding school for a year. All three knew about Pitzer from other Thai scholars who studied at the College. For example, Rittiron went to the same high school as Patcharaporn “Nam” Maneerat ’17, who is now in graduate school in geology at University of California, Berkeley. “The word is out—Thai scholars want to come to Pitzer,” says Michael Ballagh, associate vice president for study abroad and international programs. As international students at Pitzer, the Thai scholars spent their first year in the College’s International Scholars Program, a curriculum designed to develop college-level language proficiency. Jitmana, Rittiron and Sudta say they are graduating with expertise in their areas of study and with confidence in their ability to navigate—and succeed in—a new language, country and culture. Ballagh notes that the Royal Thai scholars have also changed their classmates and the College. When we speak about developing intercultural understanding, he says, we often focus on the “outbound” American students who study abroad, but global education is also about the intellectual and cultural exchange that take place when international students come to the US. On Saturday, Rittiron, Jitmana and Sudta’s four years at Pitzer will culminate under a tent topped with Pitzer-orange flags and filled with their classmates and professors. Their parents will also be in the audience, having traveled to the US for the first time to see their daughters cap off this leg of their journey with a Pitzer diploma in hand.